Cookeville, TN, (November 27, 2018) – American Powertrain™, an industry leader of TREMEC® transmission conversion kits for GM, Ford, Mopar and AMC, has now been named the 2018 Elite Performer by TREMEC Transmissions. 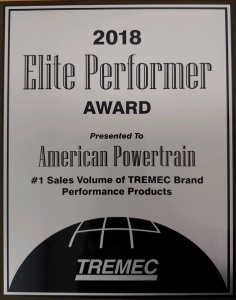 The Elite Performer Award is given to the authorized TREMEC dealer that has the number one sales volume of TREMEC brand performance products for the year. The award was presented to Robert Hall, owner of American Powertrain at the 2018 SEMA Show by Nate Tovey, Enthusiast Marketing Director for TREMEC. 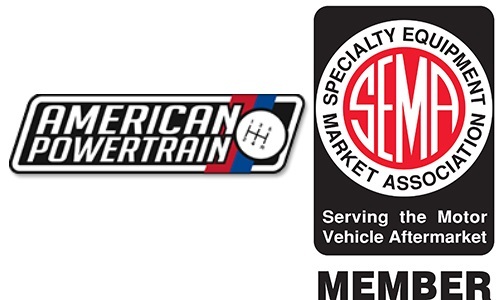 American Powertrain formed in 2006, is an Elite Distributor of TREMEC aftermarket transmissions. The company has long been one of TREMEC’s top performing dealers in the world by becoming a one-stop shop for model specific overdrive transmission installation systems for classic muscle cars, trucks and hot rods. American Powertrain’s ProFit™ transmission installation systems are recognized for their superior fit and performance. With the company’s primary goal of making it easy to convert your classic car over to a modern overdrive transmission, and recognized by the company’s tag—Save The Stick, American Powertrain has grown sales by providing exceptional tech service support, top quality products and all the necessary components to install a modern, problem-free overdrive system. TREMEC, established in 1964, began as an OE manufacturer of passenger vehicle transmissions for Ford, GM and Chrysler. 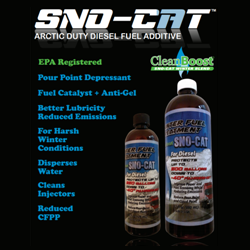 The company established their performance aftermarket transmission line in the late 1990s that today includes T-5, 5-speed rear wheel drive transmissions, TKO 5-speed rear wheel drive transmissions, Magnum and Magnum XL 6-speed rear-wheel drive transmissions to retrofit early model vehicles with a late model overdrive manual transmission system. TREMEC’s aftermarket transmissions feature multiple shifter locations, a variety of gear ratio options, dual speedometer pick-ups and are available with either single or double overdrive. For more information about American Powertrain TREMEC transmission overdrive kits for Ford, GM or Mopar, visit americanpowertrain.com. 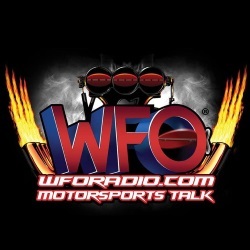 To speak with one of American Powertrain’s highly qualified technicians, call 931-646-4836. For weekend and holiday calls, a call back service is available at 423-773-9789. American Powertrain™ exists to help muscle car owners equip their cars with modern drivetrain technology, offering overdrive transmission systems, hydraulic clutch kits and a wide range of drivetrain related parts from diff to block. Since American Powertrain opened for business, we have quickly become the world’s largest TREMEC dealer. Our installation parts and systems are proudly made right here in America for unmatched quality. Our staff of highly experienced enthusiasts has years of experience helping car owners and builders make the right drivetrain choices.